Well, that's been a busy ol' year! Across England, Scotland, Wales and Ireland, we ran more crafty hen workshops in 2017 than ever before. That's a whole lot of Crafty Hens out there! We've looked back to discover which activities proved themselves to be the most popular options booked over the past 12 months. Is your favourite in the list below? Coming up in 5th place, our ceramic painting workshops are a great relaxing activity to enjoy in your home or weekend accommodation. With the option to decorate a tea set for the Bride, or to paint individual items to take away, this workshop always results in brilliant personalised mementos for the Bride. Perhaps the perfect group activity for any sophisticated hen do! 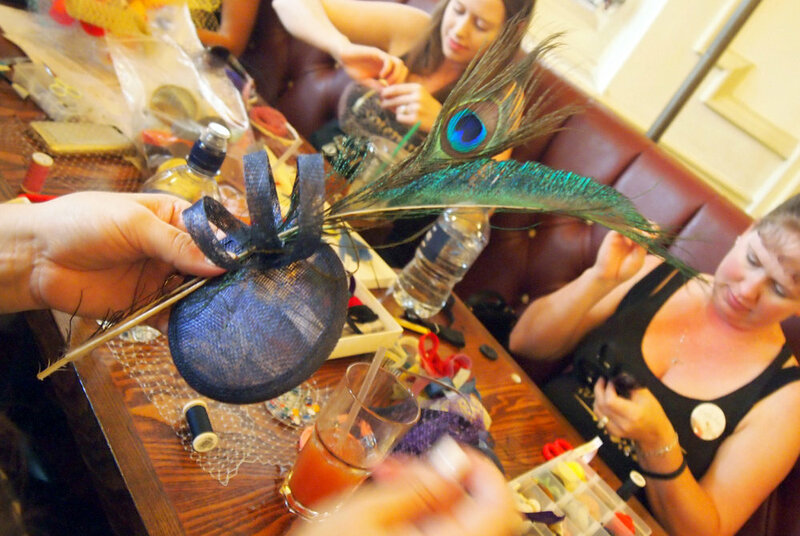 Oh so many of our Crafty Hens make fabulous professional fascinators to wear to the wedding - and it's even nicer to see the Bride To Be making her own bridal birdcage headwear for the special day too! Over the past five years, this alternative hen do idea has long reigned as one of our most popular activities. Finding itself in a very respectable 3rd place this year shows just how much of a classic hen party workshop this is! Always a special activity, our patchwork parties get all the hens together to collaborate on a unique quilt or set of cushions, perfectly themed to the Bride's wedding colour scheme. It's so great to see how each and every patchwork quilt or set of cushions is so different, and full of personal touches. Also available for baby showers too, so Mum To Be can create a bespoke baby blanket with her closest friends and family. Accounting for over a quarter of all our bookings this year, there was no doubting which workshop would be crowned number one. It is of course flower crown making! From bold summery head garlands, to chic winter crowns, you'll never have been far from of one our flower crown adored crafty hens in 2017. Perhaps you'll even spot one in the wild in 2018. We've been inundated with lots of bookings for next year and some of our most popular sessions are quickly booking up months in advance. So, if you think one of our top 5 workshops or any of our other crafty party options would be perfect for a special event you are planning, come say hello and to tell us all about it. Help us make 2018 a craftier year than ever before! Here's to another year full of crafty hen parties, creative baby showers and unique PR events!